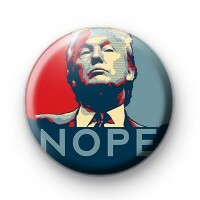 This is 1 inch NOPE TRUMP pin button badge. If you don't support Donald Trump and his politics then this might be the badge for you. How will his Presidency affect America? Thx so much for the swift delivery. Badges look brill and will be great stocking fillers. Merry Xmas to all at Koolbadges.